This oddly-shaped, solitary fish is capable of camouflaging itself against the coral it lives near. It ‘walks’ on its fins, and will wiggle its illicium (the first spine of its dorsal fin) like an angler with bait to lure in prey. The longlure is voracious and can swallow fish larger than itself, which makes it a poor aquarium fish. Longlure frogfish, flagpole frogfish, pescador cana larga, pescador cana tenebroso. The common name “longlure” is a direct reference to the elongated illicium which acts as a fishing lure. The longlure frogfish is not considered a good aquarium fish due to the voracity of its appetite. The species is a delight to see in the wild, but it takes a very good observer to pick out a frogfish because of its camouflage. This fish is not listed as endangered or vulnerable with the World Conservation Union (IUCN). The IUCN is a global union of states, governmental agencies, and non-governmental organizations in a partnership that assesses the conservation status of species. The longlure frogfish is found from in the western Atlantic Ocean from Bermuda and the Bahamas, south along the coasts of Central and South America. It inhabits shallow reefs at depths less than 215 feet (66 meters) where it quite easily mimics surrounding sponges. The longlure frogfish is a bottom dweller, occurring in warm shallow waters. The frogfish uses its stalked pectoral fins and its pelvic fins to slowly “walk” across the bottom. 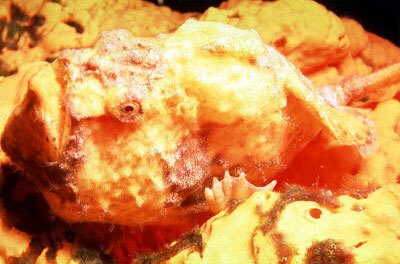 Frogfishes have been observed inflating themselves by filling their stomachs with air or water. This is a solitary species found in small populations. The longlure frogfish is a short, fat, globular species confined to the tropical western part of the Atlantic ocean. It is a small fish, generally not exceeding five inches. Its skin is thick and covered in highly modified scales called dermal spicules. These spicules are prickly in appearance and resemble the warts of a toad. 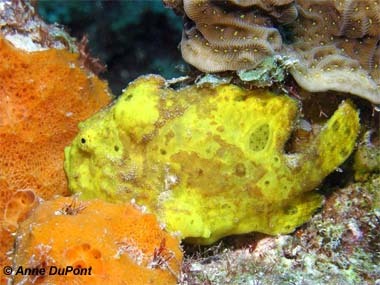 The frogfish has small eyes, a very large mouth that is directed upwards, and its pectoral fins are situated on stalks. The gill openings are very small and located behind the pectoral fins. The name “longlure” is a direct reference to the elongated illicium which acts as a fishing lure. The illicium is the first spine of the dorsal fin, highly modified into a long rod with a lure at the end. 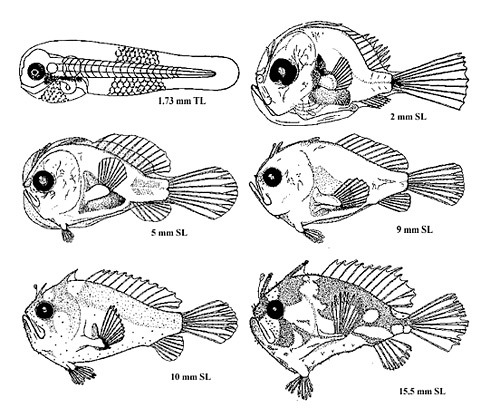 The second and third dorsal spines are separate from the others and covered in thick skin. 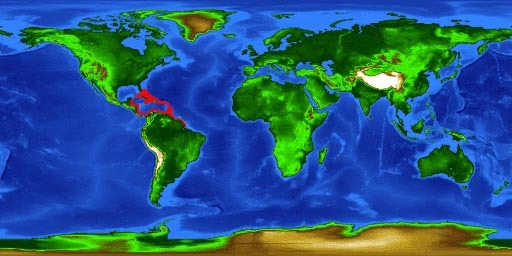 The basic color of the longlure is highly variable, ranging from pale yellow to bright red or dark green to reddish brown. There are black spots scattered across the body no matter what the base color. It also has a phase where the body is completely black, except for the ends of the paired fins which are white, and for a pale area that resembles a saddle on the back. 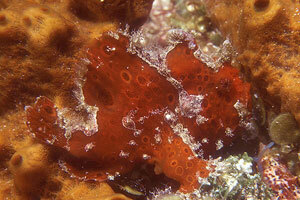 It is commonly found lying in sponges in shallow waters around coral reefs. 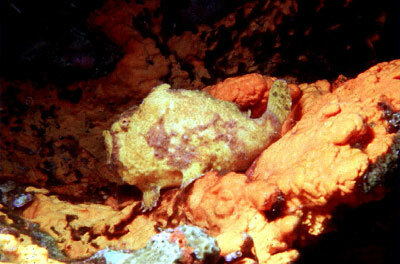 The longlure frogfish generally conforms to the color of the dominant sponge in the area, with the spots resembling the openings of the sponge. The longlure frogfish grows to lengths of about 4.5 inches (11 cm). This frogfish lies in a sponge and waits for a fish to swim by. It then wiggles the lure around in order to attract the prey. As the frogfish lumbers across the bottom, it moves these spines around in the same way as a snail moves its eye stalks, attracting small fish and crustaceans with its lure. It is capable of swallowing a fish that is larger in size than itself. Eating mostly fish, the longlure frogfish has been known to occasionally feed on crabs and mantis shrimps. Just like a recreational fisher, the frogfish will move to a different location if no fish are biting, using its stalked pectoral fins and its pelvic fins to slowly “walk” across the bottom. A unique feature of the frogfish family is that the extruded eggs are encapsulated in a ribbon-like buoyant mass of mucus, referred to as an “egg raft.” This structure may serve as a means of transporting a large number of eggs over large geographical distances. Immediately prior to spawning, the male and female march across the bottom, with the female in front and the male close behind. The male’s snout is usually in immediate contact with her vent. The female is bloated with eggs during this time, often swelling to twice her normal size. The pair dashes to the surface and the egg mass is expelled from the female. The frogfish may spawn several times over the next few weeks. This species was first described by Valenciennes in 1837. The name multiocellatus means “many eye-like spots” in Latin, referring to the color patterns of this species. Synonyms include Antennarius tenebrosus Poey, 1852.